First impressions of the App Radio. Very nice looking unit. Functionality is good. Please keep in mind, THIS UNIT DOES NOT HAVE A CD DRIVE! THIS UNIT ONLY WORKS WITH IPHONE 4 4th GEN UP. IT DOES NOT WORK WITH ANDROID OR ANY OTHER NON IPHONE SMARTPHONE! The unit itself, is a typical pioneer double din. Nice sleek design. The unit has an ultra sharp hi-res screen 6.1 inch multi touchscreen. The SPH-DA01 is a well constructed unit as you would expect from pioneer. Mounting applications are included for Double Din installation only. For certain models of vehicle you will require a D-Din mounting kit 113mm available from Armour Automotive (Autoleads). 113mm D-Din cage kit from Ray Smith. One of the best functions of the SPH-DA01 is the customisable steering wheel controls. You will be required to buy the steering wheel interface separately. Once installed you can program the unit to except specific commands from certain steering wheel buttons. This is a brilliant idea as it means you are no longer tied to the regular functions of skip track and volume up and down. The touchscreen is a hi res 800 pixel by 480 pixel 6.1" WVGA capacitive multi touchscreen, its a really good quality picture if I'm completely honest. In fact I would go as far as to say its better than the screen on the AVIC-F930BT. Basically it functions exactly the same as the iPhone 4 touchscreen, quick, easy flicking and scrolling between GUI's. Its remarkably quick too. The unit includes a few standard features like FM/AM radio with your standard presets. Built GPS system and GPS antenna included. The Built in GPS system works with your Navigation app on your phone so the Navigation software is not included with the unit. You can use Google maps but there is a recommended Navigation platform available called MotionX Drive which is available from iTunes. Pandora is also available for the unit which gives you access to internet radio. There are other apps you can use for internet radio however Pandora displays everything properly on the App radio's main display. The unit has built-in Parrot bluetooth (Fast becoming industry standard), it functions almost the same as the Parrot CK3100LCD, the only thing it doesn't seem to do that the 3100 does, is voice dialling. The iPhone is connected via bluetooth for the phone kit functions only, if you want to use your apps then you need to be connected via the supplied iPod lead. The unit also has a rear/reversing camera input and a subwoofer pre-amp stage rated at 2V. The only buttons on the front of the unit are at the bottom. They are Volume up and down on the left hand side and a Home button bottom centre. The home button take you to the main screen from any page. One thing about the Apps, now I've not experienced the process as I don't actually own an iPhone4, but you going to be paying for most of these apps. I'm not 100% sure of costings, I would imagine they're not going to be too cheap though. The unit is only compatible with the iPhone 4 and Ipod touch 4 gen, so all you 3G and 3GS users have dipped out. I would imagine the App Radio will be compatible with the iPhone5 when it reaches the market, well at least I would hope so, otherwise this unit may just be a fad. It says you can access the apps from the iPhone itself which is true. However most of the apps required have to be specifically for the APP radio. Not just any App will work from the unit. Having said that, the Apps that do work with the radio are very good. For example using Google maps for navigation, I-coyote for realtime speed camera, speed limits, traffic accidents. Internet Radio now comes into play too but this does rely heavily on the 3G reception plus you need to be aware of your mobile internet tariff as it uses a lot of bandwidth. This could be a problem as most UK mobile companies have restricted 'Unlimited data' to '500mb' a month. I would highly recommend GiffGaff mobile if you want genuine unlimited data access, how long this will last I'm not sure, but its by far the best mobile broadband deal on the market. The unit works as you would expect the iPhone 4 to work. Full touchscreen with App icons exactly as they appear on the iPhone. All Apps for the SPH-DA01 are available from the App Store on iTunes. Now keep in mind that this unit is new, at the moment the Apps are limited but in time this will improve. Now the best I can say is because the unit has been available in the US for 6 months now there are more Apps available to UK customers. The unit is actually the same as the US version. This means any Pioneer App downloaded from iTunes will work across the globe. Unfortunately I have only had the opportunity to play with the unit in a customers car after it was installed. Clearly the Pioneer App radio is a must have for Apple technology junkies. If you don't have an iPhone 4 and don't intend buying one then this is not the unit for you. UPDATED 14-11-2011 - Pioneer have now launched Apps for the United Kingdom and Europe. These Apps are now available from iTunes store via Pioneer Apps for App Radio. This should make the unit function inline with the US version of the unit. I am however reserving judgement until I have had the opportunity to play with these new Apps. UPDATED 24-10-2011 - I have now had the opportunity to use this unit with a customers iPhone 4. In a word disappointed! Despite the Pioneer build quality, the functionality of the unit with the Apps available is very poor. The Navigation recommended by Pioneer from the App Store doesn't work in the UK. I-coyote is a bit hit and miss. Pandora internet radio works fine but is very 3G reliant as with all internet radio options. Even the iPod side of things doesn't quite function how it does on the iPod or iPhone. You can't just flick and scroll like on the iPod or iPhone, there are list up and down buttons on the left hand side of the touch-screen to scroll up and down. Not sure why they would do this but they have. Its a waste of the capacitive screen and makes the iPod experience a little slow in my opinion. Basically there are not enough Apps on the market at the moment that work with the App Radio. In all honesty, you might as well buy the Pioneer AVH-3300BT, it will do most of the things the App Radio will do, including internet radio via the TuneIn Radio App (there is a free and paid version although I still trying to work out the advantages the paid version has over the free version but can't really find any!) It will play iPod video and downloaded Youtube video's. The only thing it doesn't have is Nav. The App Radio is clearly aimed at the American 4G market and probably should have stayed in America for at least another year. Don't get me wrong the idea behind the unit is great but it's just not ready for the UK or Europe yet. If I was to give this unit a mark out of ten then it would be 5/10. I would hope that next year there will be a similar unit from Pioneer but aimed at the Android OS from Google. Personally I think it would be a mistake if all car audio manufacturers do not embrace the Android platform. Pioneer’s revolutionary, game-changing AppRadio™ is the first car stereo to revolutionize the driver’s smartphone experience by bringing compatible iPhone® 4 apps to your dash. 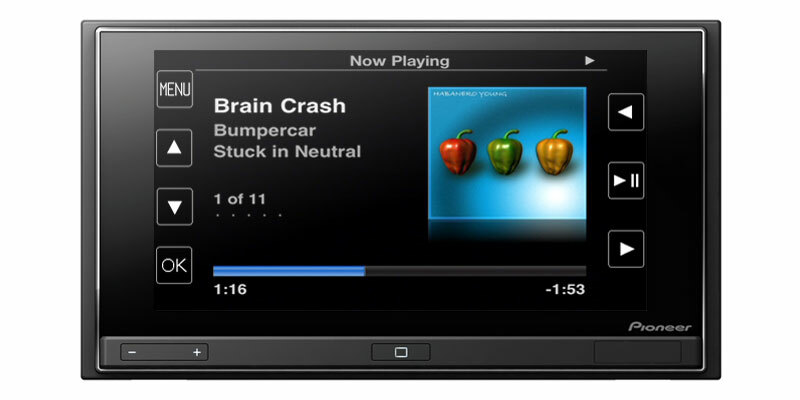 When connected to an iPhone 4 (or a 4th generation iPod touch) loaded with Pioneer’s free AppRadio Application, the AppRadio in-dash stereo provides the ultimate in-vehicle smartphone experience. Featuring the first ever in-dash, capacitive touchscreen, you can enjoy full on-screen access and control of your iPhone contacts, calendar, maps, and more with an intuitive interface, formatted and designed specifically for safer in-vehicle operation. 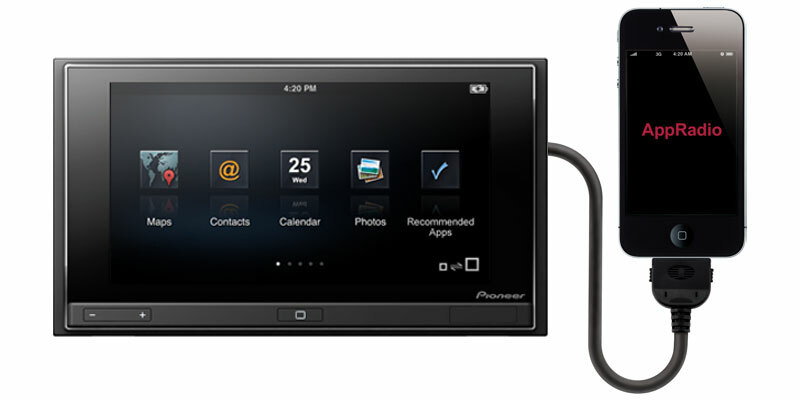 Pioneer has teamed up with several app providers to offer compatibility with many of today’s most popular in-vehicle apps, while also developing an expanding catalog of AppRadio compatible apps for future features and functions that can be easily and seamlessly added. AppRadio will even notify you when new compatible apps are released. Now I would expect to pay somewhere in the region of about £399.00 for the SPH-DA01. You will probably find it cheaper online, so do a little research before you buy. Here's a link to the Radio Centre Colchester. Radio Centre has a unit on display in the shop, if you require further information from the Radio centre, please contact them on 01206 579396. Personally I won't be buying an iPhone 4 or 5 for that matter, Apple in my view have been sitting on the fame of the iPod and iPhone, this really has made them rely on others to produce the Apps and the actual functionality of the iPhone is falling behind the Android phone OS. Would I buy one? That is a really difficult question for me. Don't get me wrong the unit is fantastic as with most Pioneer electronics. However tying the unit to iPhone 4 only may have been a mistake. I probably would buy if I had an iPhone 4. Since writing the original review, I have changed my mind. Even if I had an iPhone 4, 4s or iPod touch 4th gen, I still don't think I would buy this unit. Main reasons, lack of working Apps for the UK market, No CD/DVD drive, SD card slot or USB port. You are literally tied to the iPhone 4 without other options. Marks out of 10: 5/10 - disappointing, there is a niche in this market for such a device, however the App Radio at this moment in time doesn't do it. There are some additional links on the page. To Pioneers App Radio page and to the Amazon product page. Have fun with your research and thanks for reading. I have one installed in my truck and I have to say I am very happy with this unit. There is way to much hating out there on this radio. It does have its pros and cons but it is incredible buy for $300 that i payed for it. This unit is for I phone 4 and 4S users. This unit does not have an optical drive. I don't care about that because optical media is obsolete to me. This unit only has one set of RCA Preamp Outputs this is Full Range or Sub woofer Low Pass Out selectable. Display looks amazing very good resolution. Sound is very good and the built in amps can drive component speakers to decent levels without distorting. Interface is very cool. Touch Screen is very responsive. Radio Tuner receives RDBS broadcasts so that Station Names and Song Name Text is displayed and the clock is set automatically. The I pod interface is great. Displays album art work can search songs easily. Watching Netflix movies in your car is awesome. Nuff said. The pros on this unit seriously out way the cons. Now let me get back to playing with my car stereo. You are obviously from the US. If you live outside of the US then Sirius Radio doesn't, nor does the 99c GPS app. That's my point about this App Radio Unit, it only works properly inside the United States, Why release a unit worldwide when it only works properly in one country. I stick to what I say in my review: If you live outside of the USA this unit will not work properly. Until Pioneer release Apps for the rest of the world this unit is not worth buying.